All-new cruiser/hot rod heads Harley’s completely updated Softail cruiser family with new monoshock frame, updated engines, uprated cycle parts and an all-new look, this is a big step up from Harleys of yore. The new Softails may still look old school but the new chassis, engines and more, as best demonstrated in this Fat Bob, are big news. Harley needed to up their game and they have. This is a hot rod with genuine style, punch and handling. The new Fat Bob is the headline bike of Harley’s all-new Softail cruiser family, which replaces not just the old Softails but the twin shock Dynas, too. The key update is the all-new, lighter, tauter monoshock frame, which comes with a variety of head angles and swing arms to suit the model, but there’s also two updated engines, all-new styling, uprated cycle parts, clocks, lights and more. 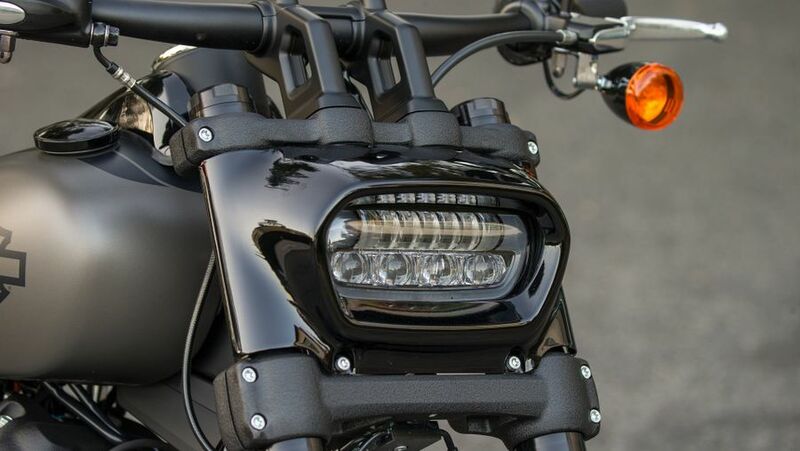 The Fat Bob shows all of this off best and is a punchy hot rod with a style all its own which grabs the eye with its new, ‘letterbox’ LED headlamp. It won’t be to everyone’s taste but it’s well-executed, rounds off a host of improvements and is just what HD needed. 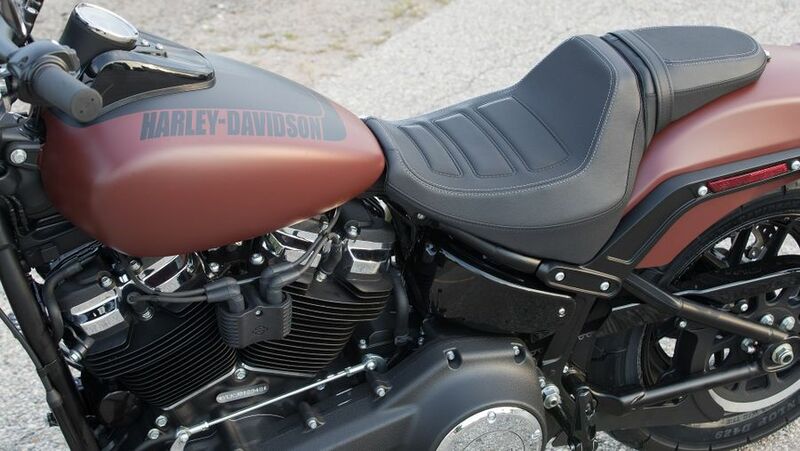 The Fat Bob, like before, is Harley’s hot rod so although cruiser-based you sit pretty much upright, reaching forward to low, flat bars and with slightly forward-set footpegs. It’s not designed for long distance comfort or nimble sports handling, it’s more an urban drag bike built for blasting away from the lights – and it’s great fun. Handling is decent, too but although reasonably comfy, this isn’t a machine for long rides two-up, there are other, better-suited Softails for that. As stated above, the Fat Bob is all about aggressive attitude, posing style and searing straight-line punch, so practicality was never much of a priority. That said the new frame means it’s comfy and easy enough (and far less of a handful than some of Harley’s big tourers, for example), round town it’s as easy as pie, you can take a pillion (just) and overall, for most things other than touring, it’s just dandy. What’s more, being a Harley, there’s the usual massive catalogue of official accessories available (including things like panniers and screens) enabling you to tailor it to your daily needs. The new Fat Bob is the performance bike of the updated Softail family and for the most part delivers impressively. The updated, partially liquid-cooled, four-valve, ‘Milwaukee Eight’ engine is available in either 107cubic inch 1745cc) or 114ci (1868cc) forms producing a now respectable 86 or 93 bhp respectively, with plenty of torque to match while the Fat Bob also benefits from fat inverted front forks and meaty twin disc brakes, so it’s certainly not lacking in the stopping power to match its acceleration punch. Again, significantly improved. The all-new Softail frame, as mentioned elsewhere, is not only stronger, but lighter, too, meaning the whole plot is noticeably more assured through the twisties than before yet has a pleasingly plush ride as well. 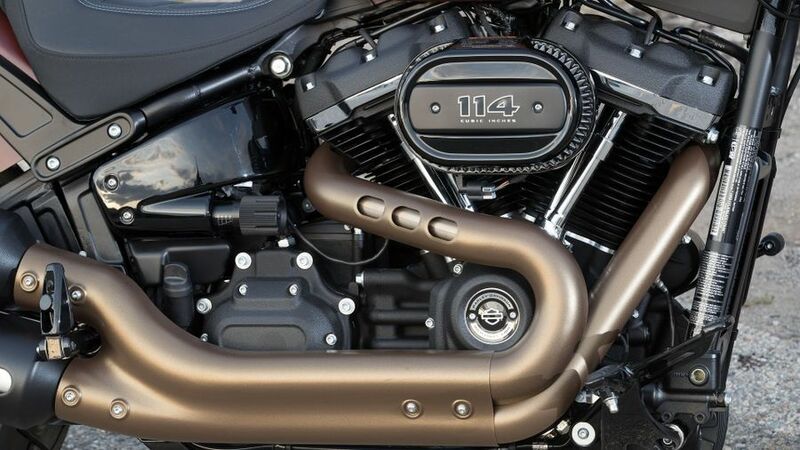 In Fat Bob form it also has the sharpest head angle (28º) of the new Softail family, which, along with that improved suspension and fat 16-inch tyres front and rear, give decently sporting steering – well, for a Harley at least. The Fat Bob truly is a ‘Hog’ that you can hustle. All big Harleys are luxury, leisure machines with the price tags to match, so running costs are never going to be cheap. That said, with a starting price around £15K, although not cheap, the Bob isn’t as expensive as you might expect either. 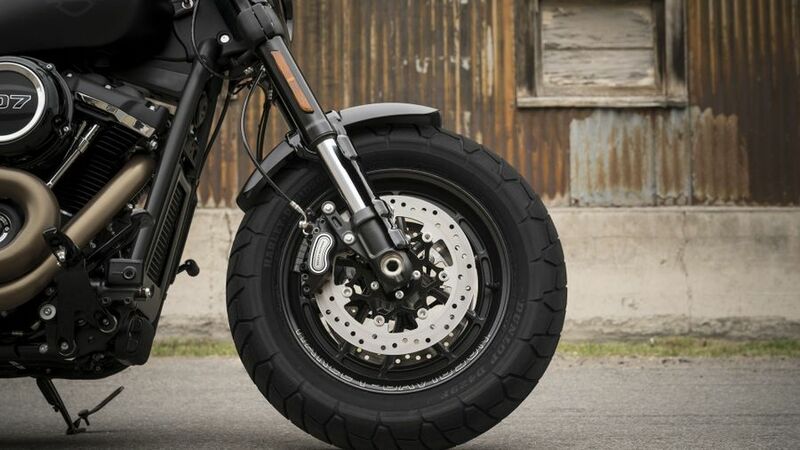 On top of that, Harley residuals are traditionally brilliant, despite its hot rod appeal, its hunger for tyres, brake pads and other consumables will be far less than, say, most sports bikes, and it benefits from long-lasting belt drive (instead of a conventional chain) as well. 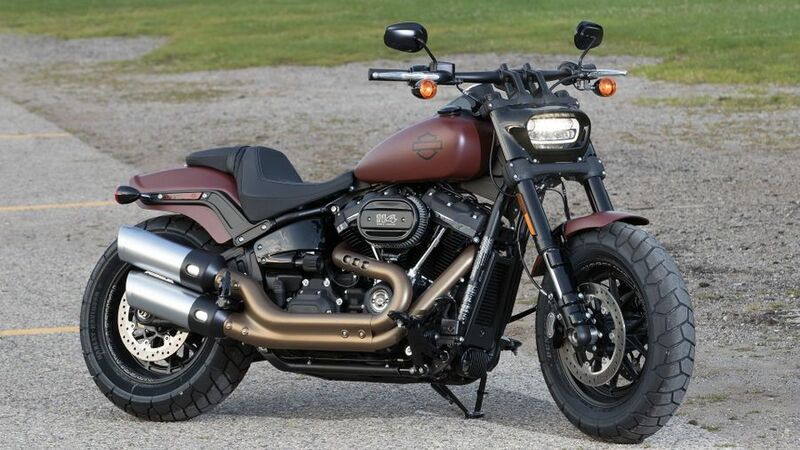 Harley big twins are generally very solid propositions with enviable reliability records and, despite this huge makeover, we’ve no reason to see that changing with the new Softails. 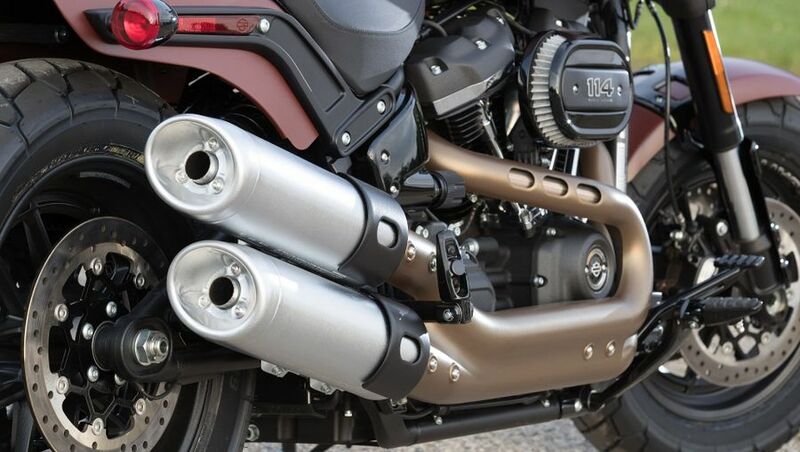 The uprated Milwaukee Eight engines were actually introduced in Harley’s tourers two years earlier and there’s been no scare stories since while the quality of the cycle parts (suspension, brakes etc) is now better than ever. The build quality is better than ever, too. The new Fat Bob’s service schedule is basically the same as all Harley ‘big twins’ with the first service due at 1000 miles and all others at 5000 miles (or 12 months, whichever comes soonest) thereafter. The warranty, too, is standard stuff, being a manufacturer-backed parts and labour affair valid for 24 months with unlimited mileage. 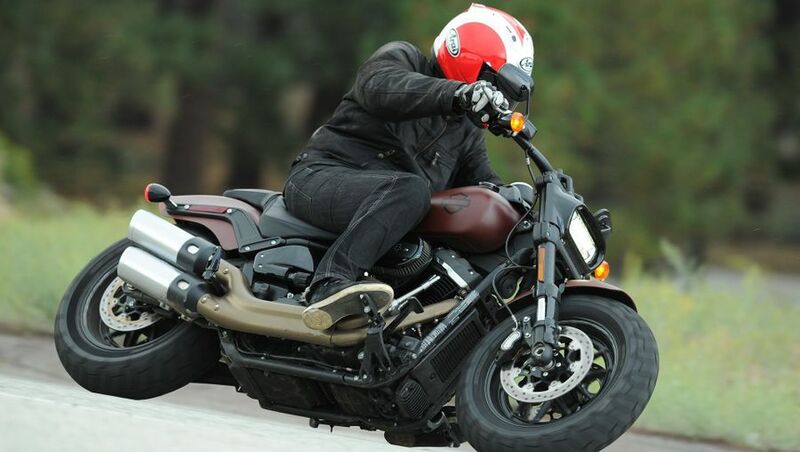 In accordance with its ‘hot rod’ style, the Fat Bob is fairly basic – but it’s still a decent step up from before. Along with those inverted front forks and twin discs, it also has that eye-catching new LED headlamp, stylish new clocks and more, especially if you dip into the accessories catalogue. That said, there’s no electronic rider aids and little by way of luxury but it’s still a step in the right direction. In recent years, particularly with the rise of new American rival Indian, it was becoming that Harley needed to up its game after years of seemingly resting on its laurels. With this new Softail family – and especially with this flagship Fat Bob model – they’ve done just that. There’s more performance, better handling, revitalized looks and improved spec. It might not have leapt ahead of Indian and still lacks the electronics and more of European and Japanese bikes (not that any of that really matter for an American V-twin cruiser) but HD now is genuinely back on par – and still has the best badge in the business!